A mere eight years ago, Wisconsin was a Democrat stronghold. They controlled the governor’s office, the State Senate, the Assembly, and both U.S. Senate seats. On top of that, no Republican candidate for president had carried the state since Ronald Reagan’s 1984 landslide. That all started to change in 2010. After years of electoral drubbings, it might look like the Democratic Party of Wisconsin is on the ropes, but they’re now making a run at an historic comeback. The only major office the Democrats have left is Sen. Tammy Baldwin’s U.S. Senate seat, and she’s up for reelection this fall. It might look like the Democratic Party of Wisconsin is on the ropes, but they’re now making a run at an historic comeback. Gov. Scott Walker is, of course, also up for reelection in the fall. In the State Senate, there are 17 seats up this November, and 10 of them are currently held by Republicans. The GOP holds an 18-15 majority in that chamber. In the Assembly, all 99 seats are up for grabs. Republicans hold a 64-35 majority there. Democrats’ quest to take back the reins of power in Wisconsin isn’t limited to local grassroots party activism, though. It’s a national effort bringing together money and manpower from coast to coast. Supporters from across the country are already contributing huge amounts of time and funding to help the cause. And two of their biggest out-of-state boosters are far-left power brokers Tom Steyer, a bankroller of liberal causes, and Eric Holder, Obama’s former attorney general and henchman. Tom Steyer is a billionaire from San Francisco. For a long time, he talked about running for governor of California. Some think he might even run for president in 2020, but he’s keeping busy in the meantime. In 2013 he launched NextGen Climate, a non-profit focused on climate change issues. Last year the group changed its name to NextGen America, and is focused on liberal youth get-out-the-vote campaigns. Billionaire Tom Steyer has pledged $30 million this year to help Democrats win a majority in the U.S. House of Representatives so they can pursue their goal of impeaching President Trump. Steyer has pledged $30 million this year to help Democrats win a majority in the U.S. House of Representatives so they can pursue their goal of impeaching President Trump. To do this, he claims to be raising “the biggest grassroots army of youth organizers and voters ever.” Specifically, he wants to get half-a-million young people to the polls on election day. Wisconsin is one of the 11 states Steyer is targeting. He says he will spend $2.2 million in the state setting up NextGen offices on 35 campuses and hiring 53 workers. So far, the group is active on 14 campuses including UW-Madison, Stevens Point, Stout, Marquette University, Cardinal Stritch University, and Carroll University. During the special elections this summer, NextGen says it knocked on 7,800 doors and made 4,600 phone calls in Senate District 1 and Assembly District 42. NextGen supplements its direct efforts with contributions to the For Our Future PAC. Over the past year and a half, NextGen gave the PAC $2.1 million. So far this year, the PAC has spent $146,576 in Wisconsin on independent expenditures in the special elections and Supreme Court race. That included everything from paid canvassers to printing to robocalls. For Our Future also plans to hire 4 staff members in Wisconsin this year. 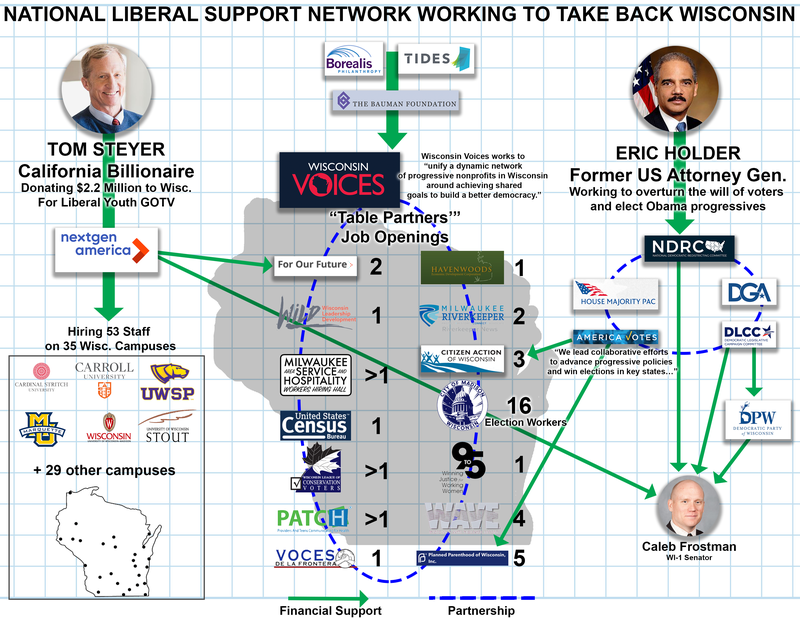 NextGen Wisconsin’s office at UW-Madison hosted a speech by the other big out-of-state heavy hitter in March – former U.S. Attorney General Eric Holder. He was in town campaigning for liberal Supreme Court candidate Rebecca Dallet. That was only one of Holder’s political goals in Wisconsin. Holder sued Scott Walker over vacant seats in Senate District 1 and Assembly District 42. He won, and the special elections were held in June. Holder’s ultimate goal in Wisconsin, and elsewhere, is to draw new district maps that benefit Democrat candidates. Holder’s ultimate goal in Wisconsin, and elsewhere, is to draw new district maps that benefit Democrat candidates. He runs a group called the National Democratic Redistricting Committee (NDRC). The NDRC spent $25,000 for Rebecca Dallet. It also spent $24,500 for Caleb Frostman and $15,000 for Ann Groves Lloyd, the Democrat candidates in the two special elections forced by Holder’s lawsuit. It spent another $10,500 against Frostman’s opponent in SD1, Republican Andre Jacque. NDRC’s board of directors includes the executive directors from four other big Democrat organizations: House Majority PAC, America Votes, Democratic Governors Association, and Democratic Legislative Campaign Committee. The House Majority PAC has already produced TV ads attacking Rep. Sean Duffy and House Speaker Paul Ryan (before he announced his retirement). America Votes leads “collaborative efforts to advance progressive policies and win elections in key states,” according to its website. It has given money to Planned Parenthood of Wisconsin and Citizen Action of Wisconsin in the recent past. The Democratic Governors Association (DGA) is also committed to redrawing the district maps. It created an “Unrig the Map” fund, which will directly support Democrat gubernatorial candidates in eight states, including in Wisconsin. The DGA also created a special website targeting Gov. Walker. So far this year, the Democratic Legislative Campaign Committee (DLCC) donated $12,000 to the Democratic Party of Wisconsin (DPW) and $4,000 to Caleb Frostman. DLCC also spent $200,000 specifically on the SD1 race, and DPW gave $13,000 in in-kind contributions to Frostman. 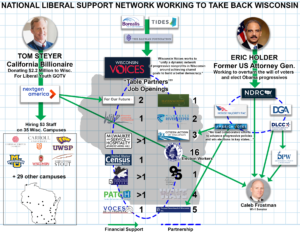 Out-of-state support for liberals in Wisconsin goes well beyond Steyer and Holder. Some big national foundations are also pitching in. The Tides Foundation, the Borealis Foundation, and the Bauman Family Foundation have all recently awarded grants to a 501(c)(3) called “Wisconsin Voices.” That’s an umbrella group for dozens of smaller liberal groups in Wisconsin. Voices regularly sends out job announcements for its “Table Partners,” which includes the U.S. Census Bureau and the City of Madison. The City of Madison, by the way, is looking to hire 16 staff members to help with absentee voting, and Voices is trying to help it find potential employees. Wisconsin Voices’ parent group, State Voices, also receives big support from those groups. The Baumann Family Foundation gave it $125,000 this year, the Carnegie Foundation gave it $1 million last year, and the Casey Foundation gave it $450,000. In Wisconsin, Voices distributes funding to state-based groups like Wisconsin Jobs Now and One Wisconsin Now. With all these out-of-state resources pouring into Wisconsin, liberals in the state have good reason to be optimistic about the fall. It’s already helped them win the state Supreme Court race and special elections in both Senate District 1 and Senate District 10 earlier this year. Wisconsin liberals are banking on that momentum to carry them through the fall general election, and they don’t care who’s bankrolling it or where they come from.